Well, you may have noticed by now that I have begun to share other people's texts too. It is not because I have become lame or lazy nor that I have nothing to say. It is just that these posts or articles are so well that there is little more to add, in my point of view. Plus they fit in within the frame of ideas of this blog. 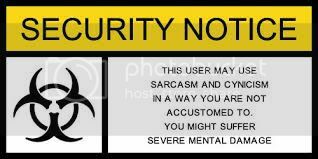 Before I post them I of course ask permission to do so first and wait untill I get it. Here's another. 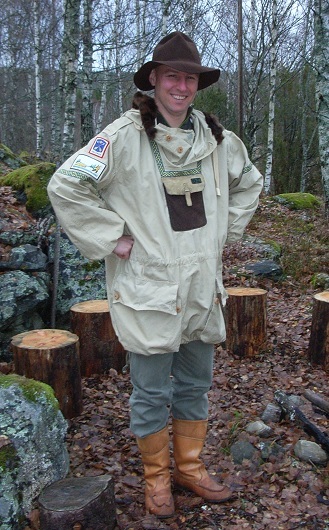 It's about ethics in regard to outdoorgear and the production thereof. I avoid buying goods made with exploited labour, and have investigated various hiking/climbing companies in order to find out who has a focus on ethical manufacture. This has been hugely informative not only in revealing to me the horrifying and depressing human rights transgressions made in the quest for cheap clothing and gear, but also in showing the gear companies in a new light. It's interesting to wander through Addnature and see which brands must be making ridiculous profits with premium priced gear subcontracted out at arm's length to the cheapest cut'n'sew factories, and to see which brands manage to sell competitively priced gear despite manufacturing out of their own factories in high-cost developed countries. This started five years ago when I had an argument with a friend. He said it was literally impossible to avoid purchases that were 'Made in China'. I disagreed out of contrariness, started checking tags when buying clothes, and found there were some brands still manufacturing outside of South-East Asia. I began to buy Scandinavian stuff as much as possible, and thereafter European or other developed countries, figuring it would mean less shipping and a higher chance of having your goods made by someone with a decent wage and with decent healthcare. Since then I have spent a lot of time reading up on fair labourand contacting companies, and realised it's not as simple as I thought. So now I want to write down my results and complicated conclusions. The first part of this post took a look at outsourcing in developing countries. Outsourcing makes the world economy more efficient, brings cheap goods to consumers and drives up the GDP of developing nations. However outsourcing has a dark side of exploitation, abuse and oppression. It's a complex issue, and one that everyone should try and educate themselves on. For this second part I want to focus on the responses from various hiking/climbing companies about the issue. I only contacted companies that I buy from (so there are many companies that are not in the mix here). However this post is not meant to be a summary of findings about specific companies. Instead what I picked up from all of this research is that the really important detail isn't where the gear is made, but the why behind the where. Preparing a moosehide - there's a first time for everything. Warning: this post contains images that might be considered graphic or shocking to some. That's usually the kind that believes meat is manufactured by grocerystores. Note to experienced hunters, skinworkers and the like; stop laughing and give me some tips on how to do it better next time! Last sundaynight I received a FB-message (yes, I do that too *hangsheadinshame*) from one of my wife's former workmates. They had a mooseskin for me! With head! If I still wanted one? Well, yes! Of course! We could come and get it on monday. Work on monday prevented me getting it, so we went this morning. I was just hoping the hide was still reasonably fresh. Turns out the moose had been shot on sunday and the hide and head had been outside in constant below freezing temperatures. This presented us with a bit of a problem; a frozen hide. After we took it home I made a makeshift rack by putting a log on top of my trestle in order to drape the hide over that, hoping to defrost it in the sun. Today and tomorrow should be the only days with non-freezingtemperatures during the afternoon. After having studied the hide and head and having marvelled at its beauty, I took my knife and cut the head from the hide. Both were surprisingly "light". I had expected them to be much heavier. 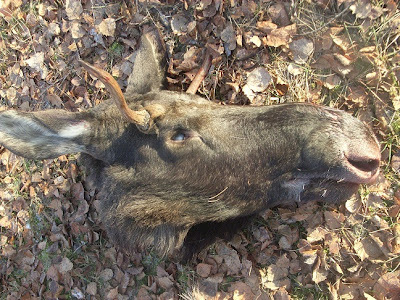 It was a young bull, only a singlepointer, whích I kind of regret, since it did not get the chance to life a full life. Pitty really, as it was a beautiful animal. The ears would make some very fine pouches in themselves, if I only knew how to preserve them. The antlers will make some very fine buttons for my naturally dyed wooljacket! Putting the hide over the trestle and spreading it took quite an effort. 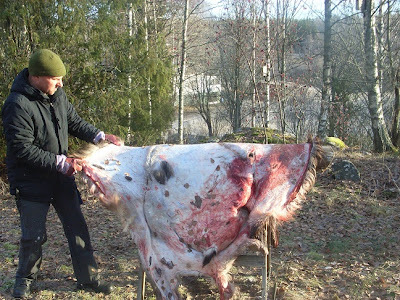 Unfortunately the hide showed several holes in it, but should still give a substantial amount of hide to prepare and tan. 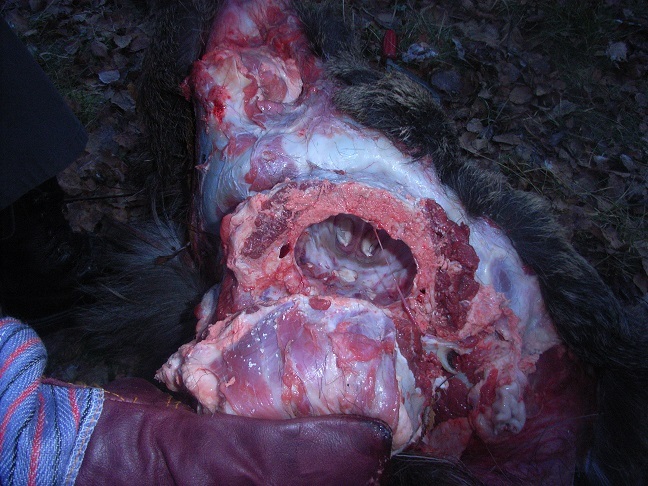 The underside of the head; the tongue has been removed and I tried to cut loose the rest of the skin and flesh in order to expose the jaws. I might be able to use them and the teeth for some boneworkingprojects at a later state. Unfortunately were the jaws frozen shut... Note the structure of the inside of the cheek! After that we had to leave the mooseremains for a while in order to visit my inlaws around lunch and by the time we returned the sun had started to set already. It is dark between 15:30 en 16:00. I had to see my father in law and ask what was the best way to extract the brains and with what tool. He has a little more knowledge about this than I do, due to his forensic policeworkyears prior to retirement. 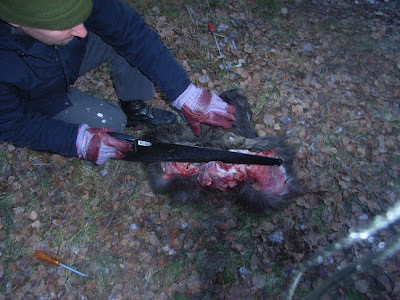 He suggested sawing the skull in a circulair way, but me being me I did it my own way and cut open the skull at the back of the head, right in front of the connecting backbone. I could see the brain through the hole in the backbone. Good thing I did! These animals have thick skulls! Once I had made the cut, a bit more than a half circle, I pried it open and scooped out the brain with a spoon. It was surprisingly little for so large an animal! I check the skullcavaity twice, thinking I missed some! 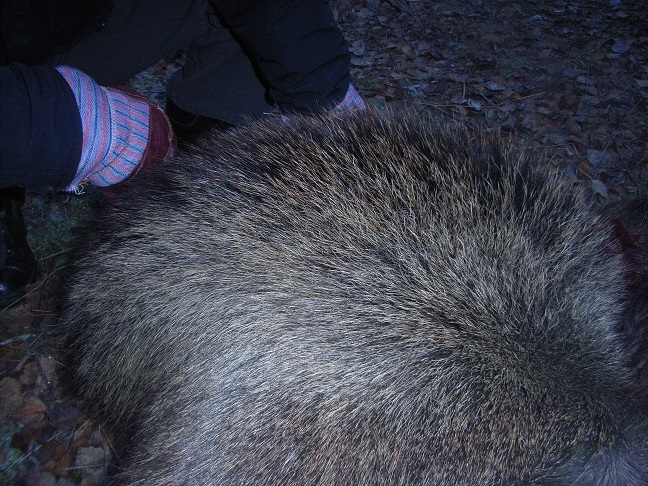 We could not help but admire this wonderfull thick fur. I so wish I could/can keep that! 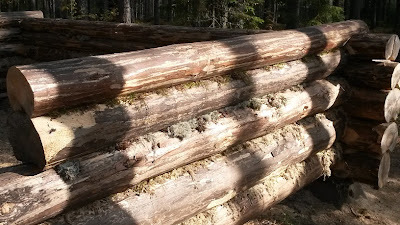 This is the part of the hide that runs along the backbone by the way. The hair was at least 10cm long. We never got the hide to defrost actually. So I just rolled and folded the best that I could and, together with the brain, put it in the freezer untill spring will give at least a week of nonfreezing temperatures, so I can thaw, scrape, soak, smoke and work the hide. This should buy me the time in order to get or make myself some hideworkingtools, like scrapers. Thanks to my wife for taking the pictures. We have more actually, but these are the least "gruesome" ones. In between taking pictures and cutting flesh or bone, we took plenty of time to study the head, the skull, the tissue, veins and what not. It's not everyday you can do your own anatomylesson on an animal under the open sky! 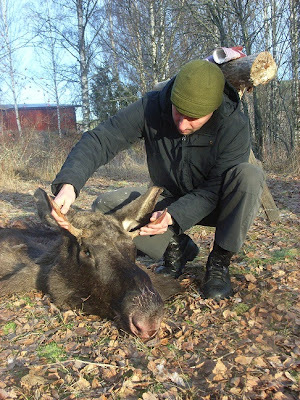 I have to admit that it felt weird and a little unrespectfull, sawing around on the skulls and antlers like I did, but inexperience offered me no alternative. I left the remaining head at the far end of our premises, so that maybe some animals can feed on it, during the cold times ahead. That way it will not be wasted. 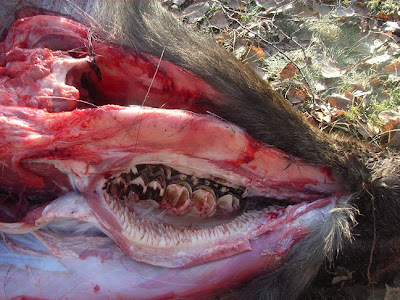 And in spring, when it has thawed and maybe is eaten clean mostly, I will collect at least the jaw and teeth and maybe other useable parts. 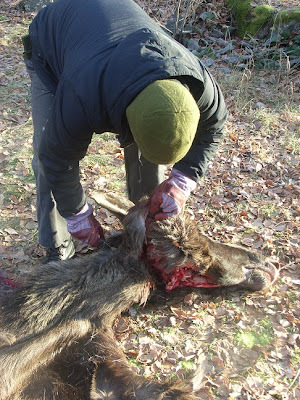 As I left the skull I thanked the animal for the hide, antlers and other parts, but also for the lessons it provided and will provide me and us with in the future. In hindsight I must say, that apart from the disrespectfull feeling, it felt weird doing all of this, but not unnatural. I think that is due to the fact that I am simply in no way used to it. This was only the second time I handled a dead animal or its remains in such a close way; the first time was the deerhide and -head, last winter. It was the first time I actually sawed bone, saw a brain (intact), felt, saw and smelled a (relatively) freshly killed animal inside and out. Yet I also felt sorry in a way to see a specimen of the animal I personally hold dear lying there like that. All I can do is try and do my best to use the materials given to me as good as I can. In my previous post I already mentioned it; my "new" daypack/ shoulderbag, the m/39 förbandsväska. 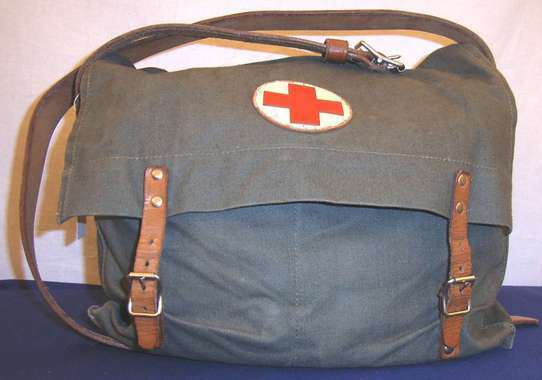 This bag (väska) was used as a medicbag, hence the förband (bandages). What are nice features are the size, the way the interior is split up and the carrying comfort (so far). 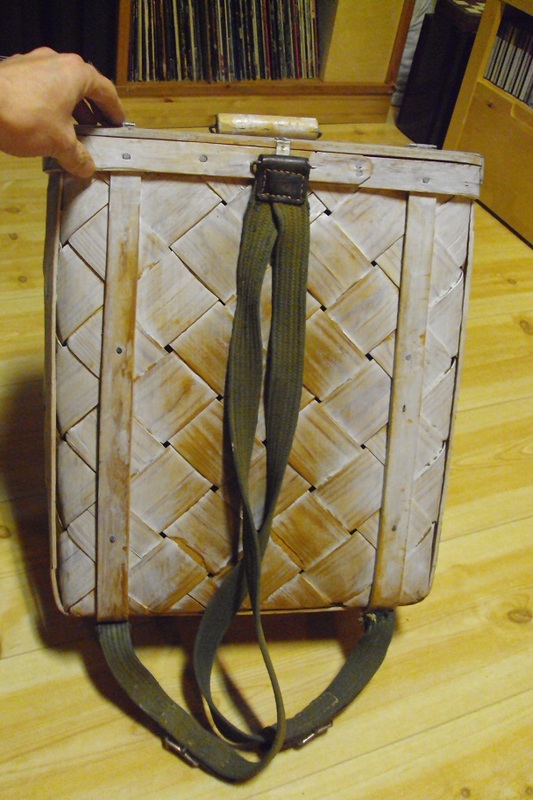 The size is 32cm wide by 28cm high by 11cm deep. 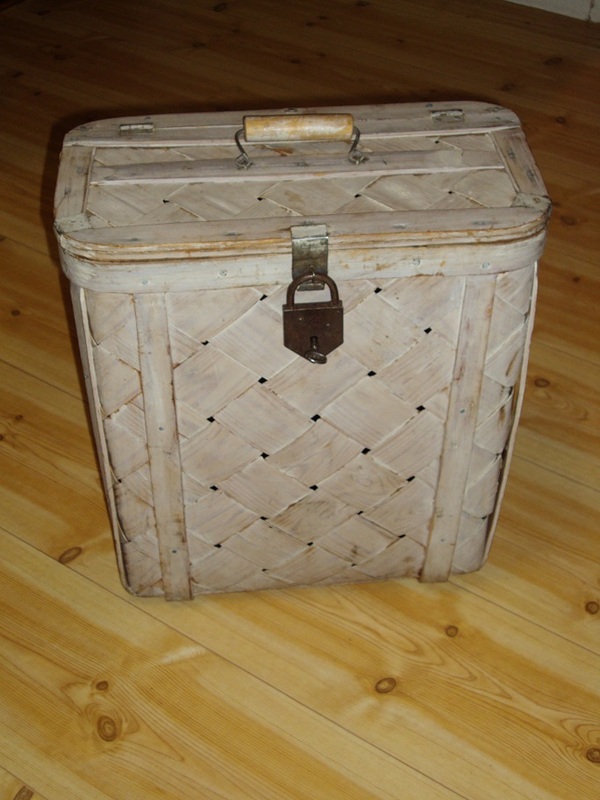 The interior is divided in to 4 seperate compartments; 2 in the front and 2 at the back. They are equelly large. That leaves room in the middle for larger, flatter things such as a book or an A4 sized binder. 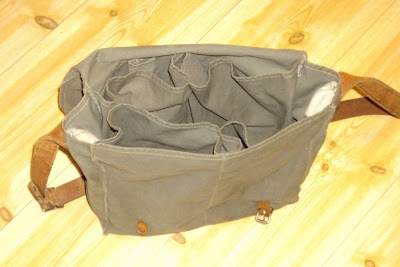 There are also 2 small pockets to the rear. I guess they were for scissors and/or a thermometer. So I went to work. 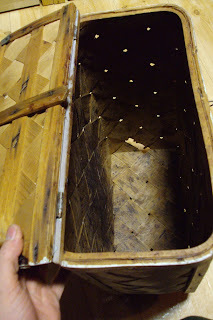 I removed the rotten leather straps and removed the studs with which they were attached carefully. I wanted to reuse the holes. 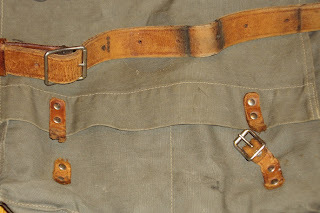 Luckily I had a small collection of leather straps and I had some which matched the colour and patina the main belt had. I also had some studs left to fasten them, but they are not the kind I like to use. You need to use a hammer to knock them together and previous experiences have shown this kind of stud tends to come loose, again. I'd rather rivet them in place and I will, given the chance. I had 2 cowhide scraps which are large enough to cover the lid.... I guess you know what happened... it takes care of both the writing AND the military look. And I like it a lot that way. For the first tryout I loaded it with a IKEA drainer hobostove+pot, a NATO canteen+mug, a set of NATO messtins and my full firstaidkit and reflectorvest plus an array of smaller items. Allthough this all easily fits in there, with room to spare, I immediately noticed that it felt far to bulky to be comfortable this way. 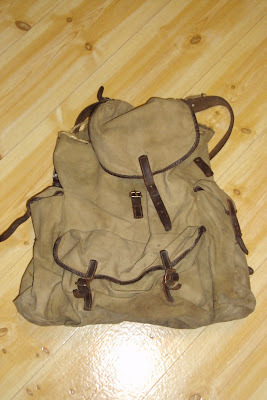 It might make a very good multiple day knapsack with just the hobosetup and the canteen + food and assorted stuff. 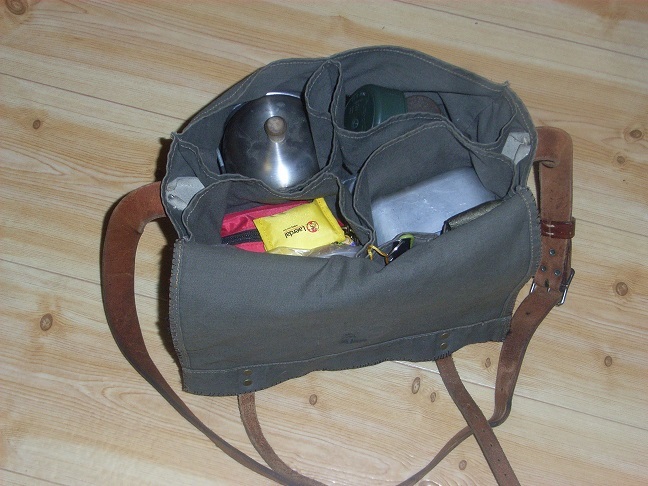 Or indeed a pack with items needed next to the finnbag.... I have to figure it out of a few trial-and-errors in the near future. 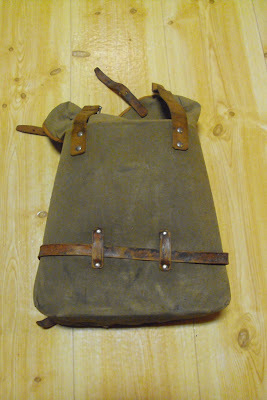 Fact is that I really like this bag already, meaning a handfull of other stuff will be "fased out" (sold if you will). Daily doings - Jobs, bargains and a great "inheritance". I'd like to do a little update on my recent activities. Recent as in "the last few weeks". Nothing to show for as far as outdoorfunthings, as I have been busy working both at home and elsewhere. 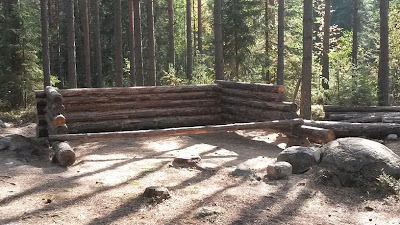 The job I should be doing in the bar in Borlänge did not materialise untill last week, but untill then I have been busy fixing the roofs on several of the buildings of the hembygdsgård and make a small start in the renovation of the interior of one of them. That meant I had the opportunity to take a good look at the buildingmethods of the past and I was surprised how well and clever the people came up with solutions back then. Solutions we'd call ecofriendly these days! Beneath the many broken rooftiles I found roofing, made water- and windtight by using layers of birchbark underneath on one building, but thin birchwoodstrips on the other! 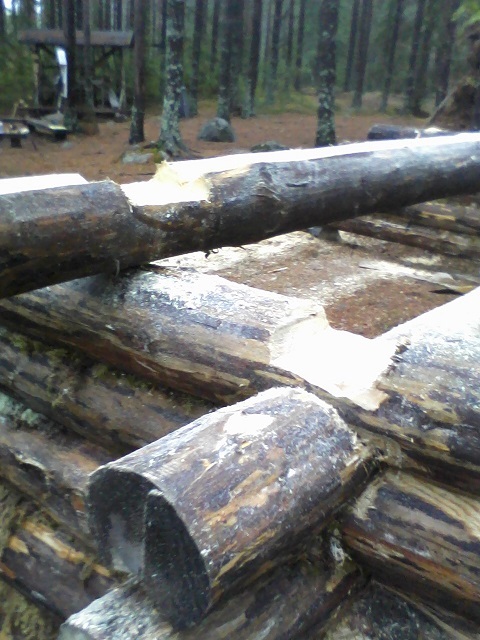 These pieces and strips were layered like shingles, befor the wooden slats, which hold the tiles, were added. I have no pictures, since I needed all my limbs in order to maintain balance and a hold upon the wet, mosscovered roofs. Inside the building that needs renovation I have been busy tearing out the very old wallpaper, which was nailed to the outerwalls. That stuff was tougher than the current bananaboxcardboard at only half the thickness! I learned that this paper not only served as a decoration, but it also created a barrier against draft. Making the room ligther was another benefit. Behind this paper were the outer walls; logs cut level and then stacked on top of one another, using moss the fill the gaps in between. After 100 years (!!) the moss is still present, with only small sections missing. I noticed a few flyspecies used these places to shelter for winter. 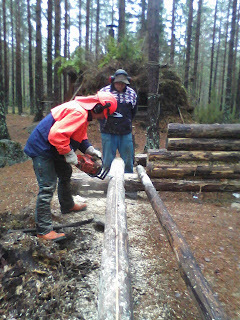 Another outsidejob was with the charcoalkiln, where we have been busy cutting and stacking the timber for next year's kiln. 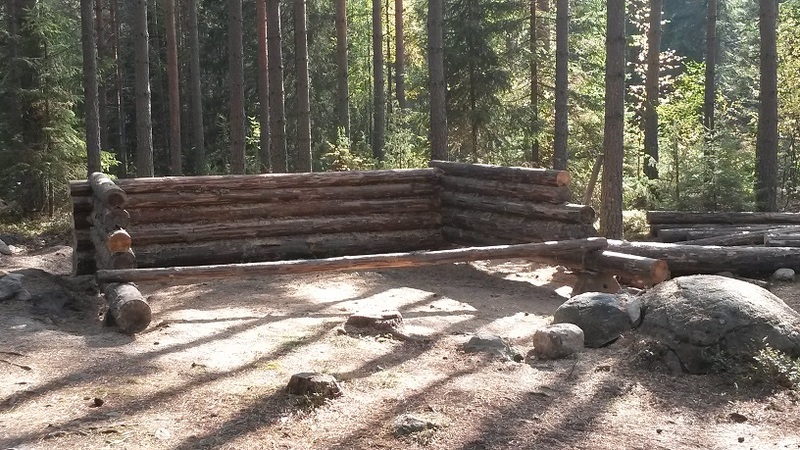 After that we did some work on the new windcover, which is being erected next to the koja. I guess it will not be ready before winter, but hopefully before the summer. ;) For the record; I just rolled the log up and down, so the other guy could cut it to fit. 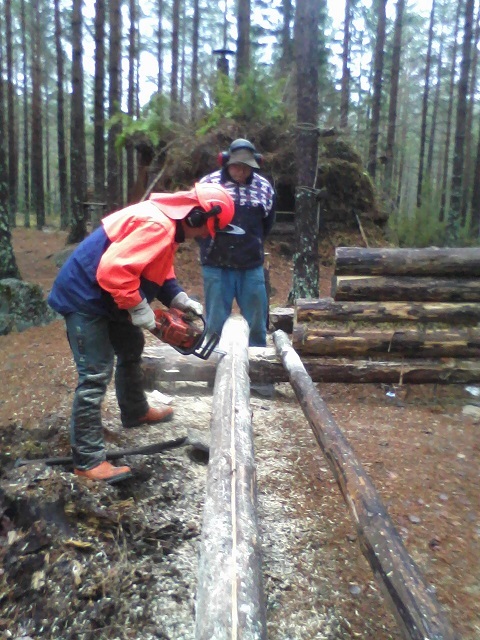 After the morning and this log, my fingers told me to quit.. 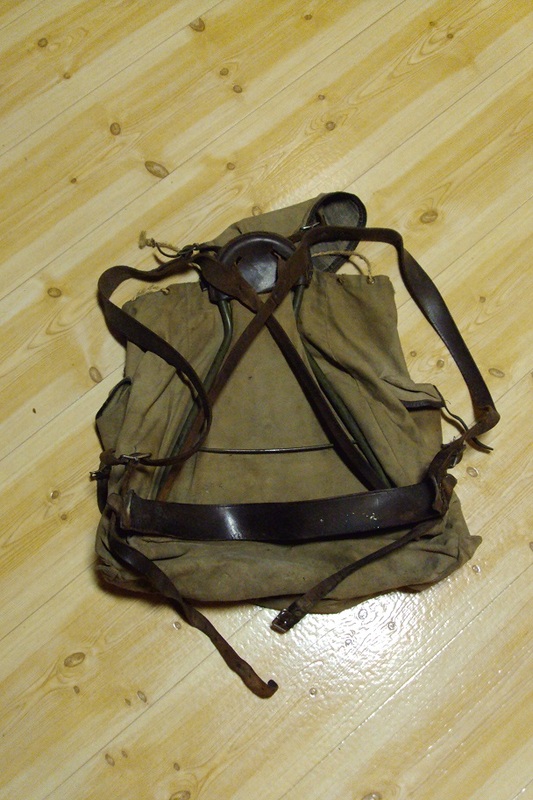 It uses the same framesystem as the m39 backpack and quite similar to the Savottapack, too. I'll wash it, clean it, stitch, wax and polish it. Add modifications if I want/need to. Hopefully the leatherstraps will hold, otherwise they'll be replaced too. I just can not pass up on a backpack like this.... The main reason I took it, is because it is a perfect crossover between the Swedish M39 and the Savotta; same measurements, same frame. It has the adjustable shoulderstraps and innerpocket of the m39, but the outerpockets of the Savotta, but the sidepockets are larger! The next item was the backpackbasket, here known as a "kont", pronounced "coont" in English. 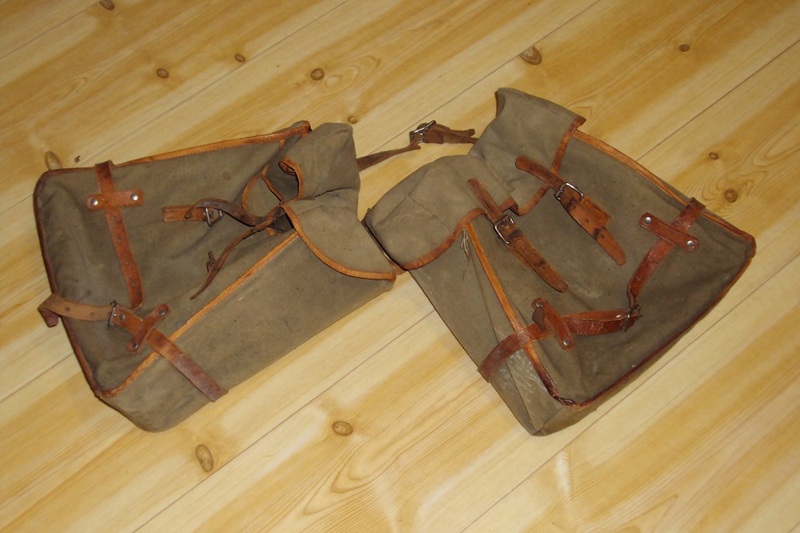 Then I have this set of saddlebags. they were destined to go nowhere too. So I snatched them. Had no idea what to do with them.... Well, I did have some ideas, but nothing solid. They might make nice bags for my bushbike (a future project, turning an old mountainbike into a bike for forestdwelling), but thought it would be a shame to ruin the old canvas and leather (here we go again) with mud and rain. So I figured they'd make a nice pair of daypacks, but then I had to surgically seperate them and remove their connecting straps..... which are in a sorry state as they are. Untill I got the medicbag, so I have no direct purpose for them anymore. Not just yet. The interior is lined with a thick cardboardshell across the sides and back. These are deformed, probably due to storage and moisture, so the front collapses inward. There is one large compartment, with a small pouch in front, under the flap. The rest of the furniture and many items we packed and stored, are meant for an auction next summer and I already decided I'll be there! 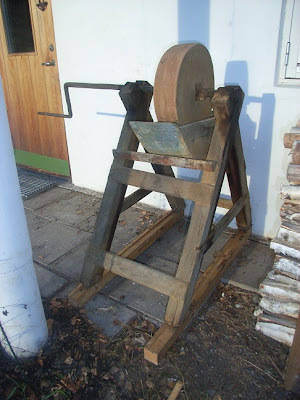 There are some things I'd really like to have, such as some old tools (especially a large saw and a dito carpenters axe), a couple of scythes with several blades. After we had cleared out the house, sheds and garage I stood alone in the now empty kitchen, looked around, thought of the woman and her husband, thanked them for the gifts I, and we, had received. I told them they were going to a good home, where they would be a welcome addition and would be put to good use. I was rewarded with a cold wind blowing across my neck..... and a deep inner feeling that is was ok to take them. With the approaching winter, and items that did not perform satisfyingly during that period, I also went bargainhunting again. I just love doing that. The first one was a wintercoat...... for the Mss.! She didn't have a decent one, so I searched and came across a coat, called "livspäls". That is an old armycoat and in full it's called livpäls m/1913. 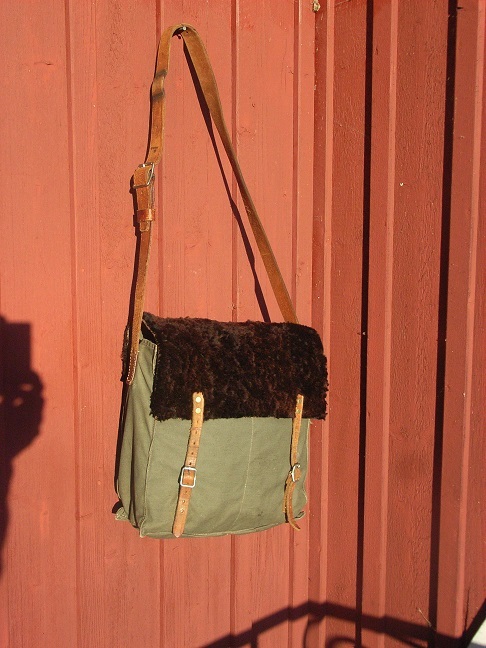 They either come in a shade of green or offwhite (I even saw some in beige) with brown or white sheepskin resp. 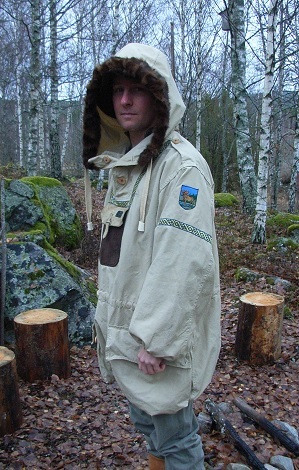 They reach down to halfway of the thigh, have a cottoncanvas outershell and a real sheepskin inner! She loved the one I found; a white one with the rankinsignia still attached. So I ordered it for her and got it real cheap; 120sek. They usually go for about 500sek. However, SWMBO was not happy with it. Although it will be (very) warm in winter, she didn't like the very wide fit and the thing weighs a ton! 9kg's to be precise.... And it was dirty, too. If I understood the shoulderrankinsignia correctly it belonged to a fänrik (sec.Lt.) 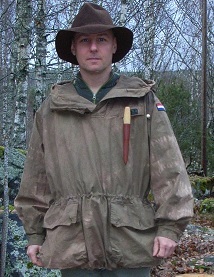 of the 2 Göta ingenjörsregt. 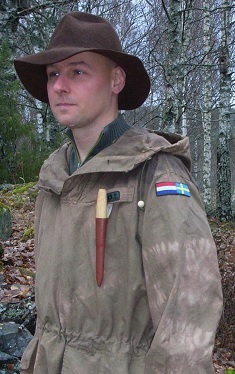 (2 Göta pioneerregt.). While it would make a great coat for static outdoorlife in winter, such as sentryduty or while riding horseback, for which I guess it was initially meant, it would be unuseable in activities. So we are thinking about reselling it, again. I do have the matching hat, which does not perform to my liking either. It exposes my lower half of the ears, which I do not like below -5 and with wind. Maybe it is too small after all? So I'll sell them as a set. Maybe that way they'll reach a collector, who appreciates their authenticity. 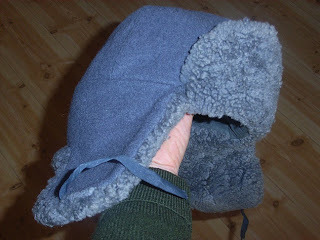 Because of the afor mentioned unsatisfying results with the Swedish sheepskinhat I got myself a new hat; a Finnish m/39 army winterhat.... and I am already loving this thing!! 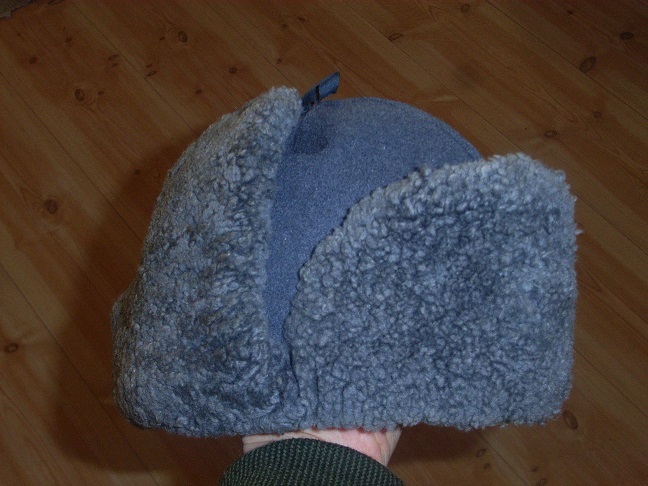 It resembles the Russian ushanka, which I thought of getting at first, but it just looks too..... Russian military... and I was told it would be too warm, even for southern Finnish winters, which I think resemble ours. 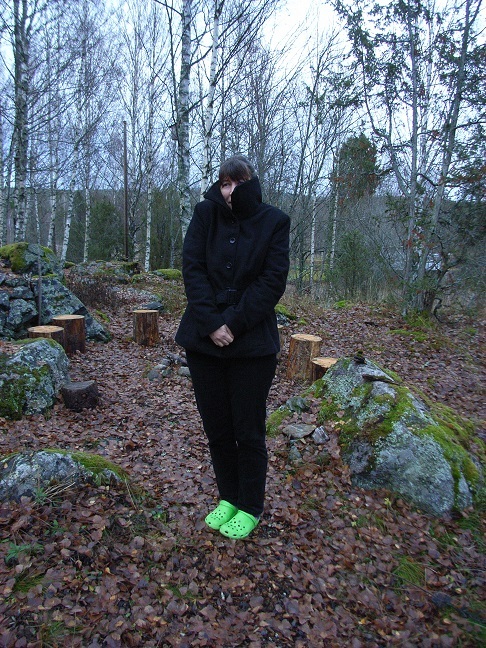 The outershell feels like some sort of woolfelt and the furliner feels like sheepskin. I removed the Finnish nationalcoloured pin from the front and I will have to change the 2 straps on the earpieces. Way too short and flimsy for my liking. Another piece of redundant gear I received was the old medical bag of the scoutgroup I (still) work as a volunteer. No longer as a leader, but as an equipmentcaretaker. It is a M39 förbandsväska or medicbag. 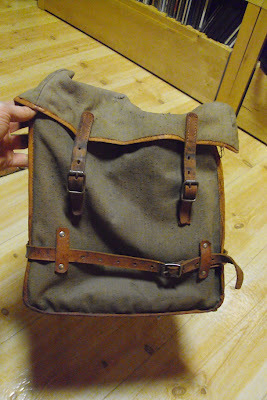 All canvas and leather (yippee), but with the closingstraps torn off and missing (not so yippee). Because of that it was no longer useable as such. 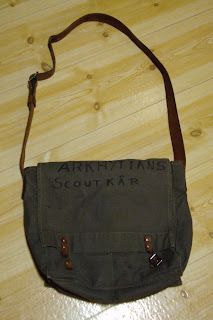 Another not so yippee factor was the large blackmarkerwriting on the lid, saying:" Arkhyttan scoutkår", in 5cm large lettering. So this and the broken straps made a nice fixingproject (yippee). I was to take it home with me and in return I will be providing them with a new medicbag; a modern British haversack/respiratorbag, made out of synthetics, so water-, dirt- and scoutproof! 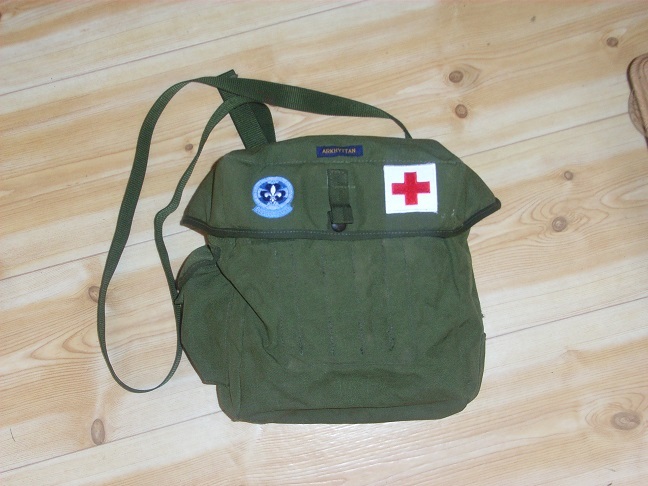 For good measure I bought a medicpatch and stitched that on, together with the scoutgroupbadges. So there you have it; a lot of extra stuff and a lot of extra funprojects to keep me busy, besides my bedroll/swag 2.0 and the other projects waiting..... Well, the förbandsväska has been done already, actually and will be my "new" outdoorbag. A member of the BCUSA-forum has gone through the trouble to make a playlist out of the several pieces on youtube about Ray Mears reviewing and commenting his views on the Lord of the Rings. I just love this combination and I'll never look at the movies or read the book the same way, again. The frequent readers here might recall that I did some modifications on a couple of Swedish army snowsmocks. If not, or if you're new, you can find the posts Here and some dyeing experiments here and here. I did not do much with the summeranorak, other then some sewingexperiments and I was not too happy with the results. In the end it turned out to be a yellowish light brownish kind of colour. After that I just put it aside, not knowing what to do with it exactly. 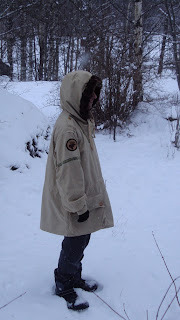 The winteranorak had shown some limitations, such as cuffs being to tight,the bottom being far to loose causing the wind catching under the anorak, limited carryingcapacity (very large pockets, where things just disappear and get cold) and a general feeling of not being done yet. Since the weather's lousy these days, as in cold, grey, dark, wet and windy (hey, it's november) I focussed some of my attention to these anoraks. 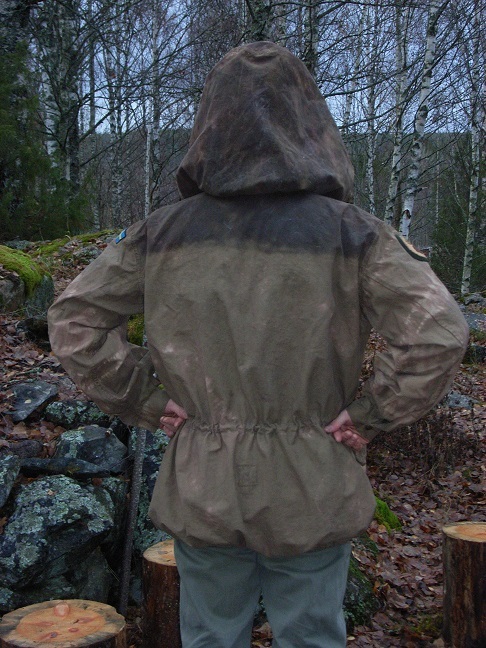 So I soaked the anorak, which still leaked a good deal of that natural dye, tied knots in the arms, found out that that didn't work with the rest, so I used tiewraps instead. Chucked the anorak in the washingmachine, followed the orders in the instructions and waited....... When done I was very surprised to see not just the fabric, but also the tiewraps were dyed in a dark brown!! After removing the tiewraps the mottlingeffects proved to be minimal, just the arms showed some of the original colour. After drying the colour was another surprise.... It did have more lighter spots, but the colour itself ranged from an earthcolour to a vague olivegreen! And I really do like it now! So after it had thoroughly dried I started making modifications. 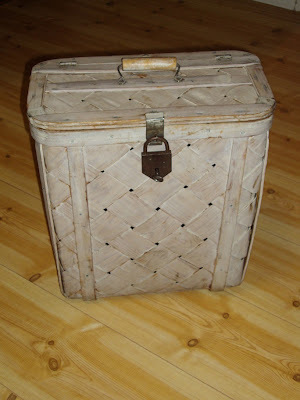 And that involved some sewing both by hand and with the machine.... Our antique one! It took a few minutes, but I soon got the hang of it. I added a tunnel around the waist to add a drawcord and opened up the bottomseam to do the same. As drawcord I used paracord, a leftover from my early bushcraftingdays, when every selfrespecting outdoorsman was supposed to have at least 50ft. of that in store.... The bottom one is elasticated string, a leftover from my armydays... in 1990!! I added some of those plastic locks, salvaged from other coats to keep the string in place, when draw tighter. I added 2 woodbeads to the hooddrawstring, which is of paracord now too. 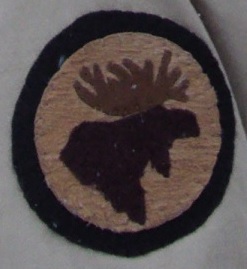 I took the selfmade moosepatch from my winteranorak and stitched it onto this one. Both look better that way. And on the other sleeve a Dutch and Swedish military uniformflague, sewn on a dark greenbase. On the strip of cloth over the left breast I added a darkgreen bloodtypepatch I once bought. 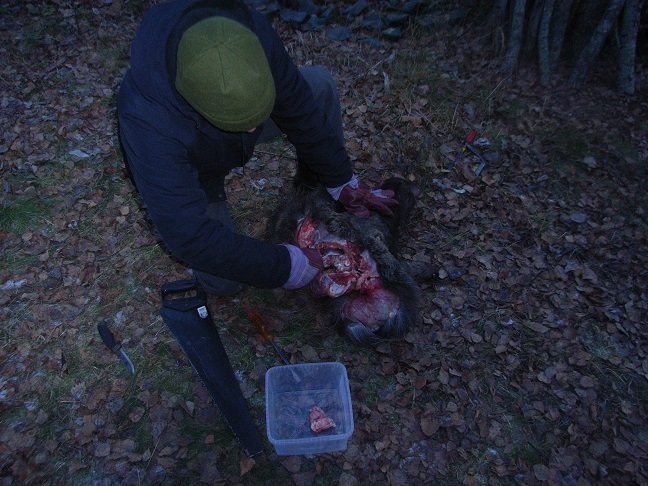 It might prove usefull, after swinging knives and axes around. I remove "the tail", the strap of cloth that usually goes under the crotch to prevent the anorak from creeping up. 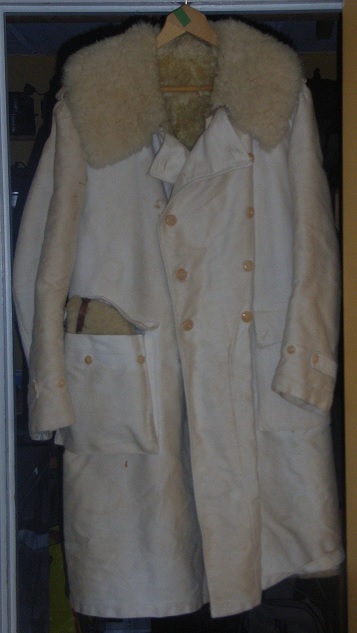 Might be handy in wintercombatconditions, but I had no need for that anymore. This left me with a sparebutton. Sparebuttons can come in handy, if they are not lost.... So I decided to try something else. I noticed that the carryingloop of Moraknives actually have 3 slits; 2 for beltuse and one... exactly... to use on a button! So i used the sparebutton. 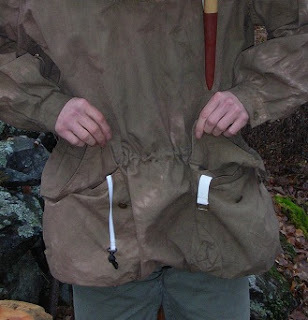 I attached it behind the bloodgrouploop, so that a) I always have a sparebutton at hand and b) I can hang my mora within easy reach. If this will work... I'll let you know later. Since this anorak will be used mainly during the months where temperatures will be above freezing, there will be rain too. I waxed the hood and shoulders to make those areas more waterrepelling. a first time for me, this waxing. Did that with a block of wax I made back in Holland, using a mixture of beeswax and parafine. A 80-20 mixture I believe. 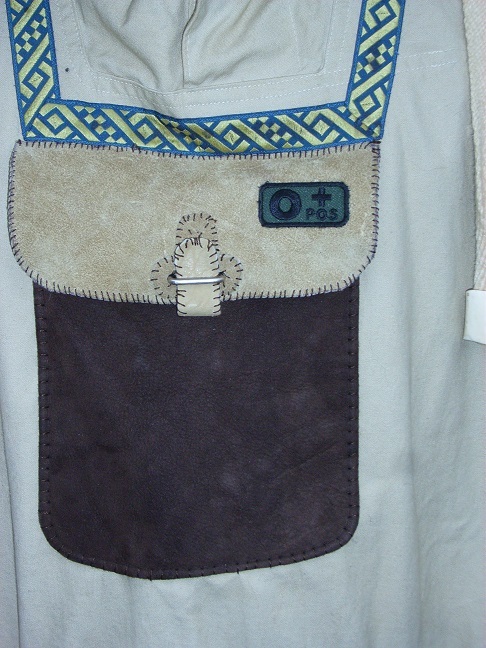 I added 2 attachmentpoints in the pockets, to keep things I do not want to loose, in there. After this one I started working on the winteranorak. One of the main problems were the cuffs. They were too tight/narrow. I could get them into wide mittens, but having the sleeve over a mitten or glove with a tighter opening was not possible or very dificult. So I took them off.... I made a new seam and added a piece of elasticated string, but thinner then the one previously used. I kept it tight enough for the sleeve to be closed, but loose enough to allow free wristmovement. 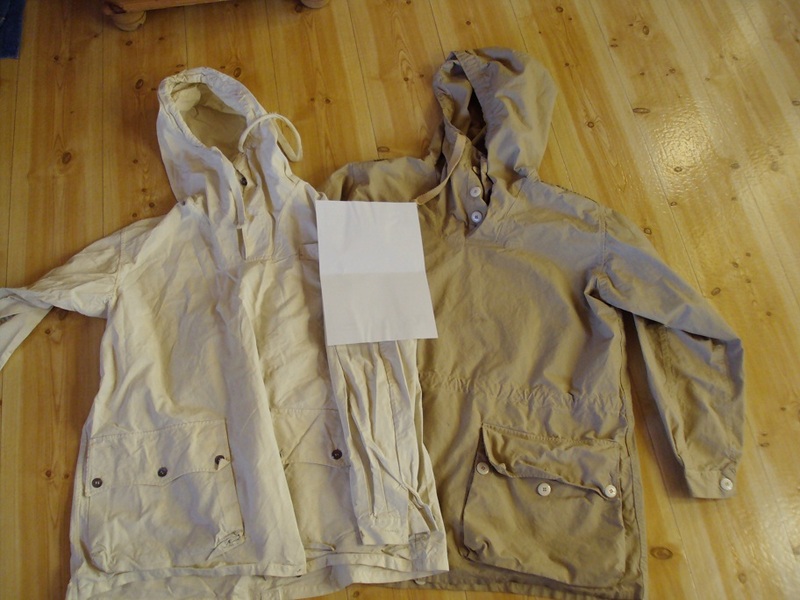 I also added a drawstring to the bottom of the anorak, so that I can close it up, should I want to. another drawback was the lack of carryingcapacity. I wanted a smaller pocket in order to keep things like a cellphone, small camera or similar items containing batteries. I want to keep them close to the body, so they stay warm and loaded, so the pocket needed some insulation. Bodilymoisture however would make them freeze up, so the pocket needed ventilation too. 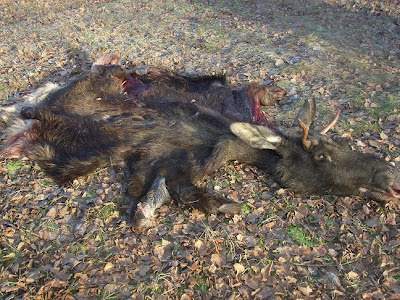 a new moose on the left, an old ('70's) Dalarna- and a brandnew wintertrekkerpatch on the right. Plus a bloodtypepatch to break up the monotonous tan of the flap. As you might have quessed by now..... I like patches! An hour well spent watching a screen, I think. The man's an icon to me. He jumpstarted my journey "out there"... And Lars Fält belongs in that same category.